While the Super Bowl is know as an all-American day of football. It is just as known for a feast of sinful goodies that you munch on for the many hours of game play. Don't let this holiday get you off track. 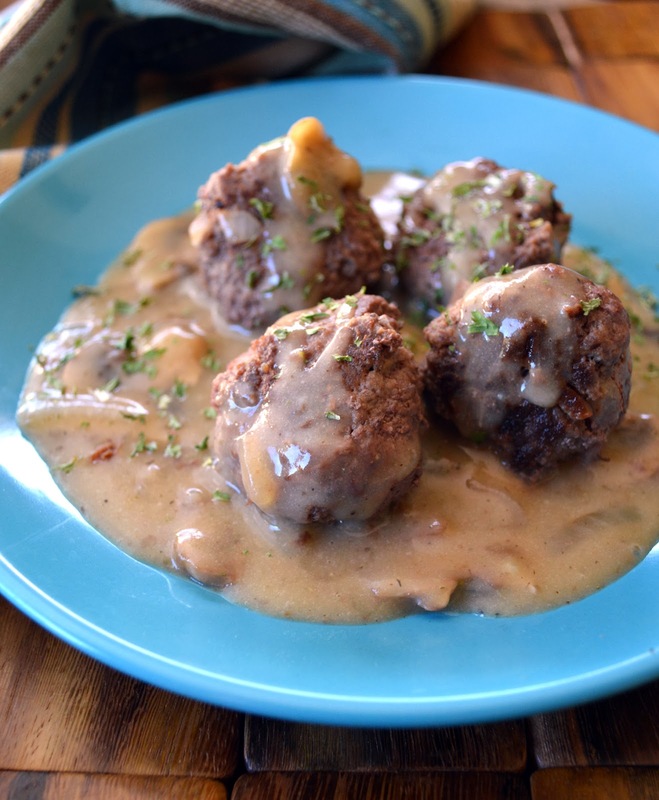 These 5 recipes will be a touchdown for Paleo and non-Paleo guests alike! 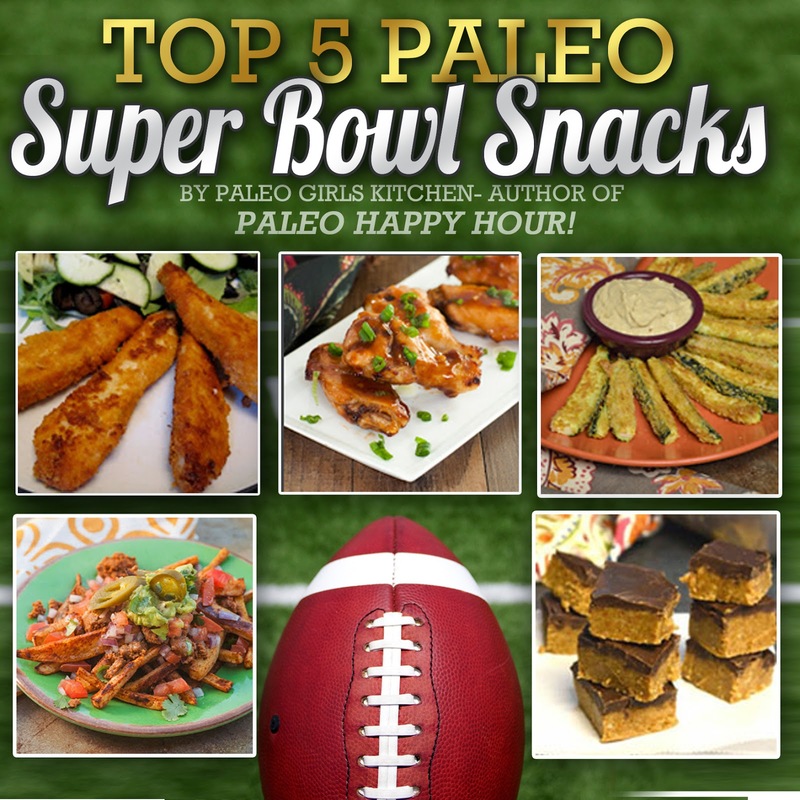 For even more fabulous football food ideas, get a copy of Paleo Happy Hour! in the back of the book I feature a party menu called the "Football Feast"! Have a great time! Also, if your looking for something to wash this food down, check out my drinks! I've seen a lot of versions of green bean casseroles that don't quite look like that old-time favorite. In this recipe, I really try to capture the flavor of the original dish. I think it turns out amazing! 2.Finely slice the mushrooms and onion. Add them and the olive oil to a medium frying pan over medium-high heat. Cook for 5-7 minutes or until the mushrooms and onions are browned. Sprinkle in the tapioca flour. Stir until you can no longer see it in the pan. Then, stir in the can of beef broth and allow to simmer. 2. If the sweet potato isn't already cooked, cube and put in a bowl. Cover it with plastic wrap and microwave for 2-3 minutes, or until tender. Add the sweet potato, coconut milk, ¼ cup beef broth, thyme, garlic powder, sea salt, and pepper to a blender. Blend on high until smooth. 3. Stir the sweet potato mixture into the mushroom gravy mixture in the pan. Then, pat the green beans dry and add them to the pan. Stir. Transfer the entire mixture to a casserole dish and sprinkle with the pork rinds. Bake at 350 degrees for 25 minutes. Serve warm. This is actually why I made the sauce, but then I was craving a barbecue/cocktail meatball, so I used the sauce to make these epic green beans. However this is a killer creamy beef stroganoff sauce as well! The Ancestral Table: Traditional Recipes for a Paleo Lifestyle. 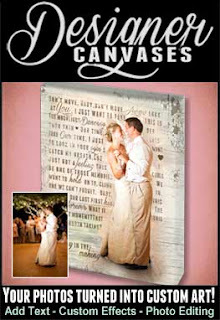 He agreed to give us an exclusive sneak peak into his book and is letting me feature a recipe! 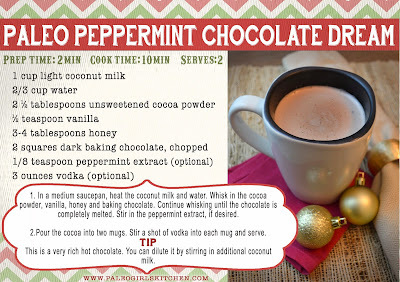 I found this recipe to have flavors that I love! Don't let the spices scare you off, because I use many of them in my book as well. If they do worry you, read this article. 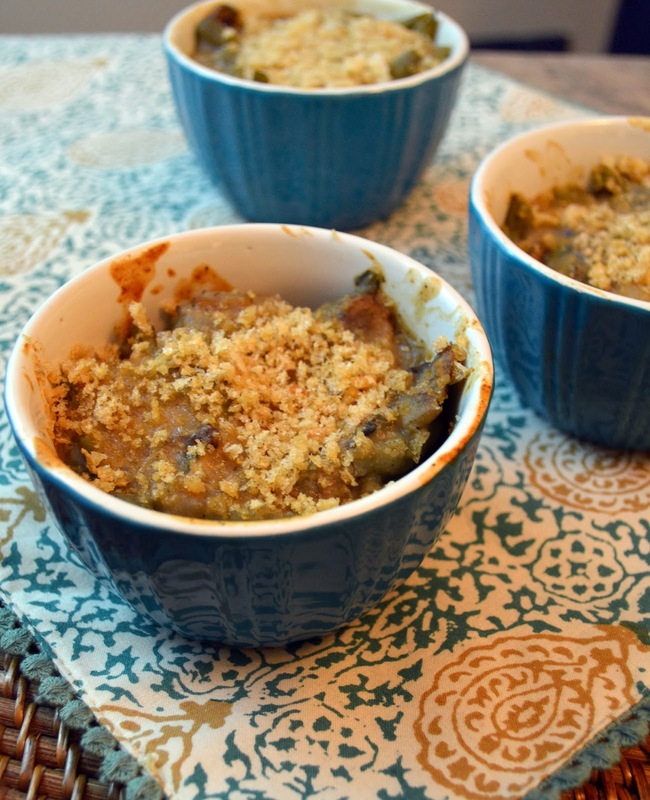 This recipe was easy to throw together as a tasty week night meal. I loved how healthy I felt after eating it. Both me and my fiance commented on how great we felt after eating such clean dish! The only change I made, was adding 3 pieces of chopped bacon in while sautéing the onion. Our grass fed beef is super lean and can turn out really dry if its not cooked with extra sauce or fat, so thats why we added the bacon. Also, I really enjoyed the tomatoes in the recipe and may have added a few more if I made it again. Collard greens are very versatile and have been in use for at least 2,000 years; the ancient Greeks cultivated them along with kale. Sukuma wiki is the Swahili name for collard greens; it literally translates to “push/stretch the week.” As the name implies, collards are available year-round in East Africa and are used to stretch out meals to last all week. 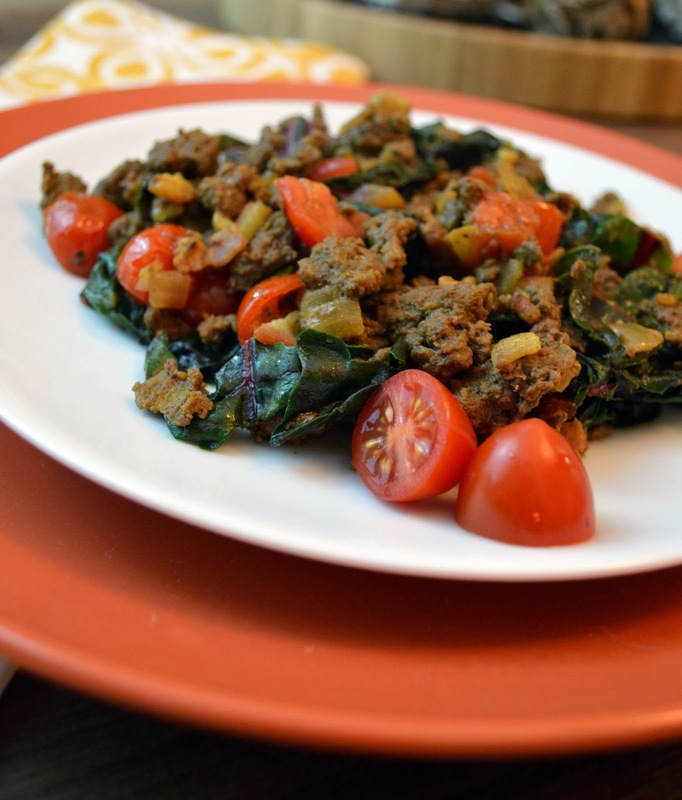 In the culinary world, sukuma wiki is a common name for a Kenyan dish of braised collard greens, usually prepared with ground meat, tomatoes, and onions. I love this dish because it’s a breeze to put together and an easy way to put something that tastes slightly exotic on the table on short notice. Make sure to prep your ingredients ahead of time, as this dish comes together quickly. 1. Warm the olive oil in a skillet on medium heat, then add the onion. Saute the onion until softened, about 4 minutes. Add the chopped garlic and jalapeño and saute until fragrant, about 1 minute. Add the ground beef and seasonings,and cook until only slightly pink, about 6 minutes; stir frequently so the ground beef doesn’t clump. 2. Add the collard greens and tomatoes and saute. until the collard greens are wilted, about 4 minutes. Stir everything gently as it cooks, being careful not to mush the tomatoes. Add the lemon juice, season with salt and pepper to taste, and serve. 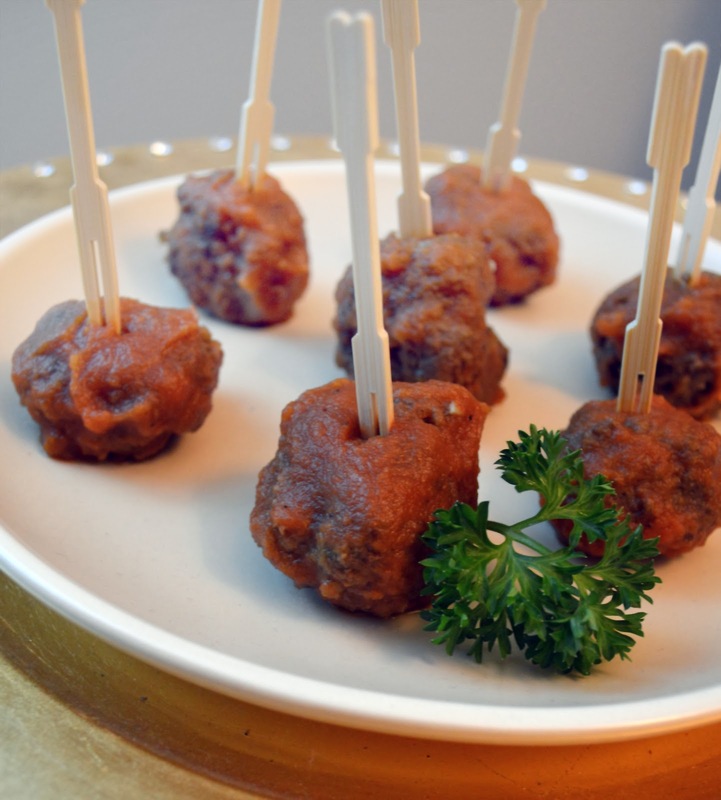 perfect as an appetizer since they will please most guests. 2. In a medium frying pan, add the olive oil, onion, and apple. Sauté over medium-high heat for 5 minutes. Stir in the tomato sauce, apple cider vinegar, honey, mustard, garlic powder, sea salt, and red pepper (if you like a little kick of spice). Simmer for 5 more minutes. Add the mixture to a blender and blend on high until smooth. 3, Add the sauce and meatballs back to the pan and cook over low heat until ready to serve. Enjoy! Happy holidays from Paleo Girls Kitchen. 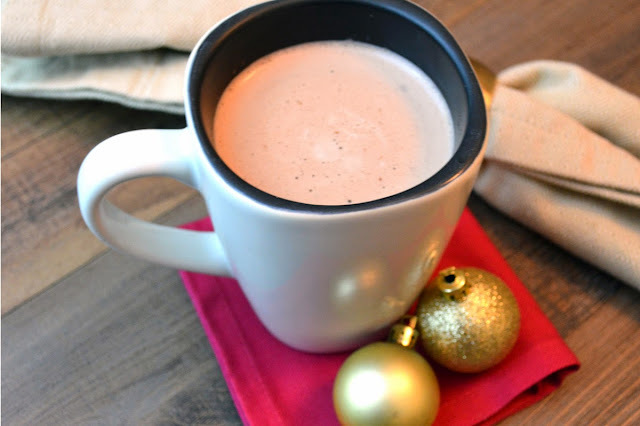 No matter how you are celebrating, this peppermint hot chocolate will add Christmas cheer to any plans (maybe leave out the vodka for the kiddos). 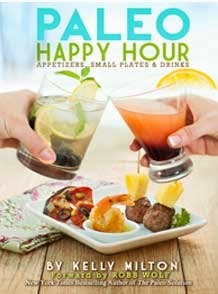 Liz Wolf over at Cavegirleats.com recently posted an awesome video about Paleo Happy Hour as well as this recipe card! Also, if you are still looking for some last minute Paleo gifts, feel free to give my book :) . 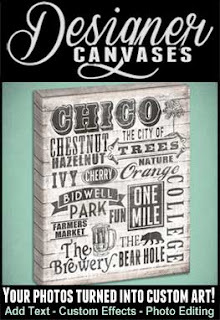 Also check out Sarah Fragoso's, from Everyday Paleo, must have healthy gift list here. Have a fun filled safe holiday season! 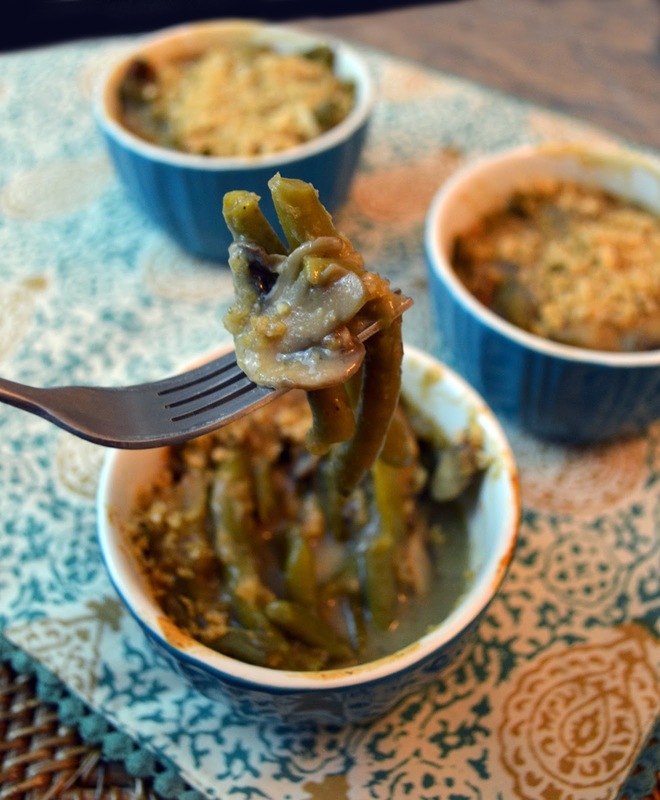 This sweet and spicy side dish is a nice recipe for the fall season. The roasted veggies are warm, filling, and the perfect addition to any meal. 1. Preheat the oven to 400 degrees. Line a baking sheet with foil and generously spray it with olive oil. Cut the acorn squash in half and scoop out the seeds. Slice it into ½-inch wedges. 2. Cube the sweet potato into 1 inch chunks. In a large bowl, toss the squash and potato with the orange juice, chili pepper, and maple syrup. Spread the mixture in single layer on the pan. Sprinkle with sea salt. Bake for 20 minutes. Flip or stir the mixture and return it to the oven for 10-15 minutes, or until it is nicely browned. Serve warm. One of my favorite easy dinners is heating up one of Diestel Family Turkey Ranch's smoked turkey thighs. My sister works there so I am very lucky to get these often! 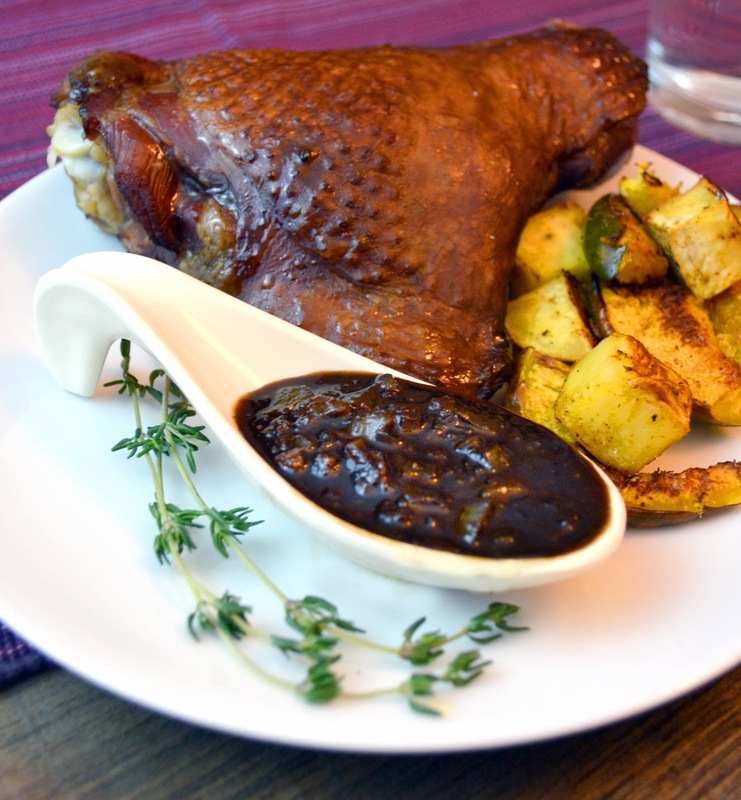 It is nice to pair the savory turkey meat with this sweet and tangy sauce! 1. In a small sauce pan over medium-high heat, add the onion and olive oil. Sauté for 3 minutes or until it is translucent. 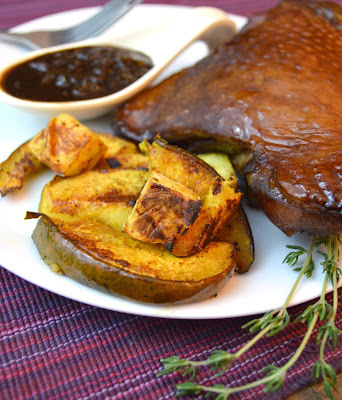 Reduce the heat to medium-low and stir in the fig butter, chicken broth, and balsamic vinegar. Then, simmer over low heat for 2 minutes. Serve with the turkey thighs or even chicken! **There are some added sugars in this product, but overall it is pretty much Paleo. If you are super-strict Paleo, you can probably make this with four really ripe figs. Add them to a food processor with 1 tablespoon honey and pulse until it is a pureé. Add that to the sauce! I would have done that initially, but there are no figs in season where I am right now.